Let’s talk nachos, shall we? You know what’s the worst? When you reach for a chip and discover that the entire platter has fused into one massive mutant nacho with soggy chips. Congealed cheese is nobody’s friend. Luckily, I have the answer! Stuff all the yummy sticky stuff inside a crispy pocket. A few months back I started shopping at a grocery store that carries a huuuge variety of ethnic and imported foods. 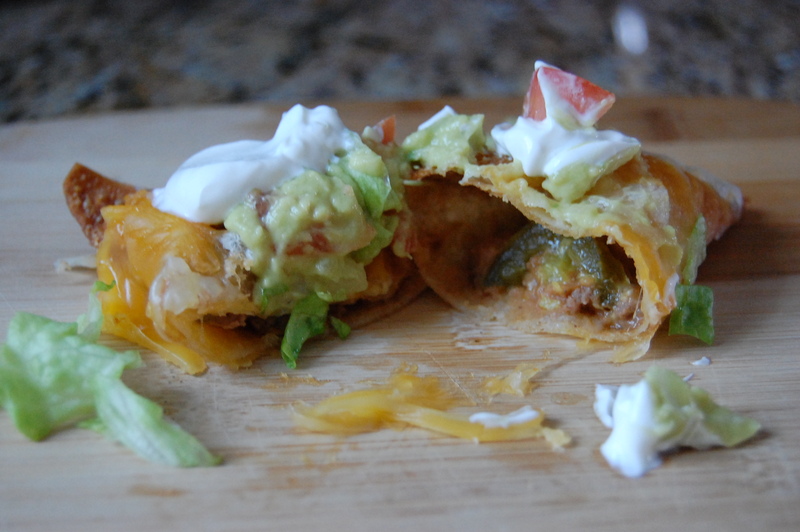 Thus began my obsession with wonton wrappers, and subsequently the solution to my nachos-turned-nacho problem. Fear not, my friends, for I’ve discovered you can find wonton wrappers in the frozen/refrigerated section of most grocery stores these days. Wrapping up the meat, cheese, and a pickled jalapeño into a wonton before deep frying ensures your fillings will stay warm and melty while the exterior gets nice and crisp, like a tortilla chip! 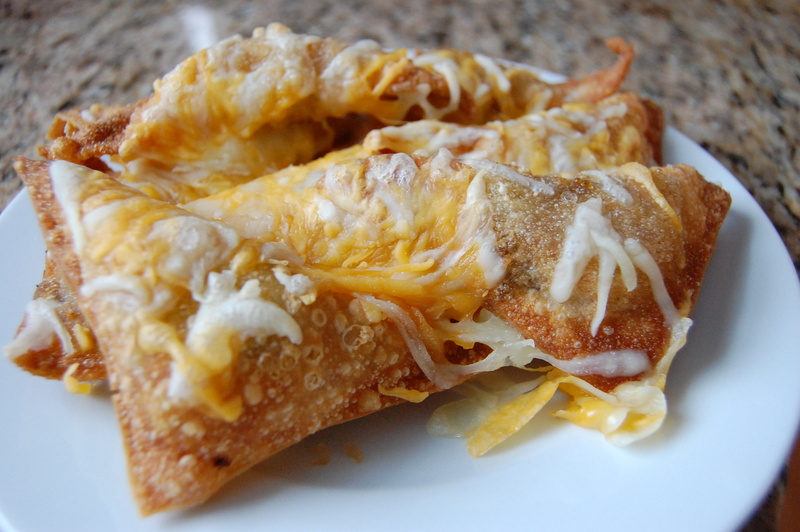 You can throw caution to the wind by adding extra cheese after frying. Stick them in the oven for a couple minutes until the cheese is melted (you do kind of risk nacho fusion again by doing this, though)! The only thing left to do is add your favorite nacho toppings. Ta-da! 1. Begin heating canola oil in large pot over medium heat. 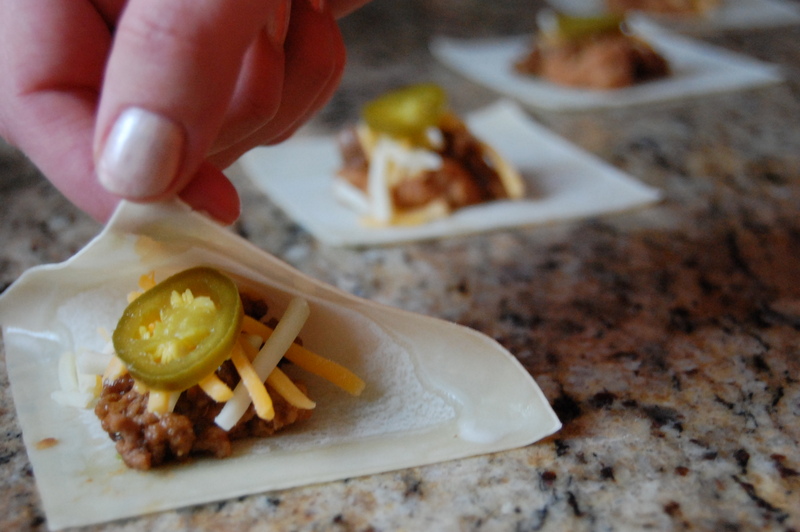 Fill wonton wrappers with ground beef, refried beans, cheese, and pickled japapeño slice. Wet the edges of the wrapper by dipping your finger into water and running it along each edge (this is what seals the wrapper). Fold diagonally to create a triangle. Press the edges together very firmly and hold until sealed. Cover wonton with a damp paper towel to avoid over-drying (and cracking) while you fill the remaining wontons. 2. 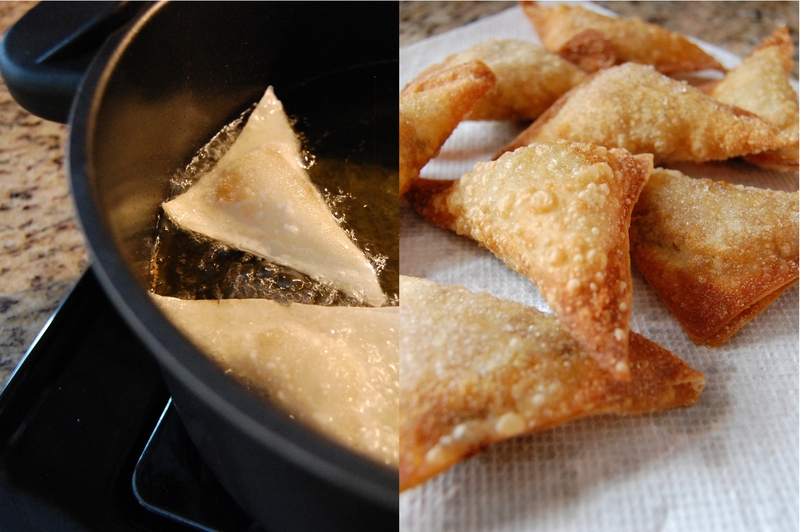 Test oil by dipping the tip of a wonton into the pot. If the oil begins to sizzle and bubble, it is ready for frying. Fry the wontons in small batches of 5 or 6, adding them one or two at a time to avoid dropping the temperature of the oil. Turn over once while frying and remove when golden brown, approximately 3 minutes on each side. Drain on dry paper towel. 3. Place wontons in baking dish and cover with additional shredded cheese. Heat in oven at 450 degrees F until cheese is melted. 4. Serve immediately with toppings. 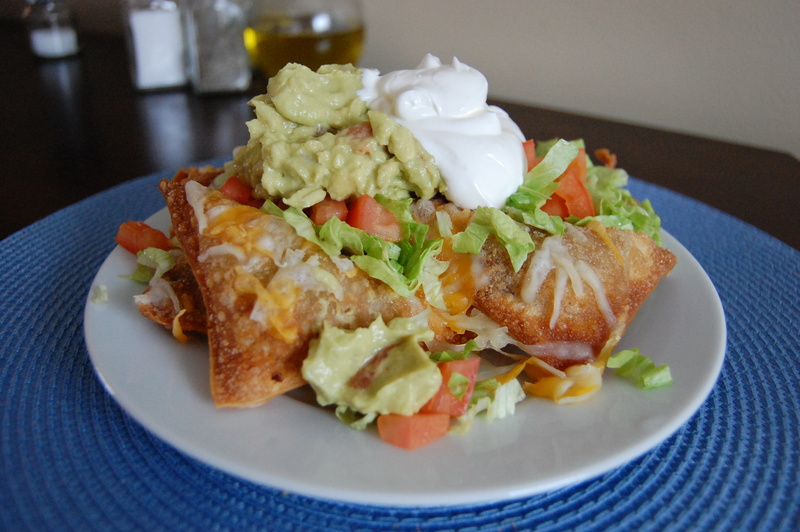 This entry was posted in Beef, Dinner, Snack and tagged Cheese, Mexican, Nachos, Spicy, Wonton by Lazy Suzan. Bookmark the permalink. WOW! THese look dynamite! what an awesome idea. These looks unreal. Pinning them right away. This is brilliant! We tend to keep wonton in the house because they are so versatile and a great way to keep food out of the bin. Thank you for sharing. This is amazing!! I need to try these!! Haha, thanks! 🙂 Give them a try sometime!! Wow, these look delicious and impressive!